The production of ethanol or ethyl alcohol from starch or sugar-based feedstocks is among man’s earliest ventures into value-added processing. While the basic steps remain the same, the process has been considerably refined in recent years, leading to a very efficient process. There are two production processes: wet milling and dry milling. The main difference between the two is in the initial treatment of the grain. 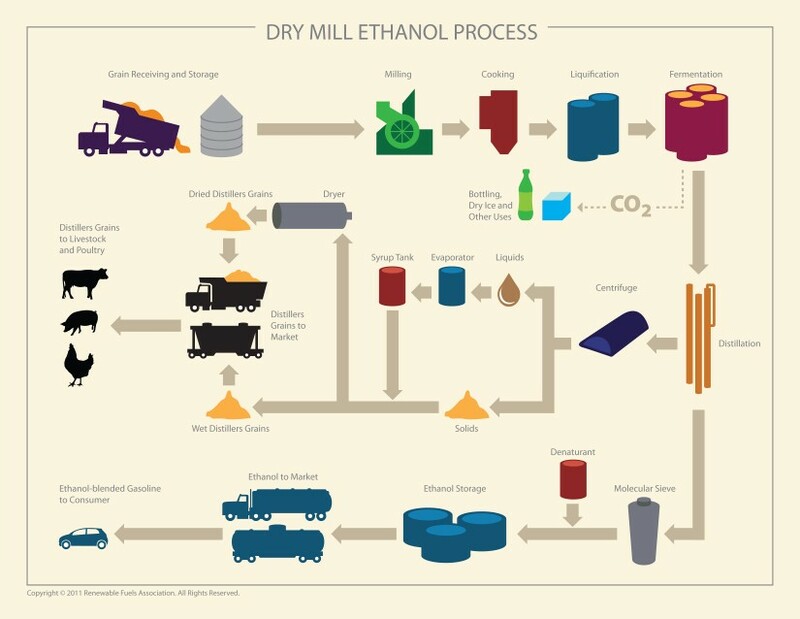 Importantly, companies today are involved in technological innovations such as fractionation, low heat fermentation, methane capture from landfills and biomass gasification that reduce the amount of fossil energy needed to produce ethanol and distillers grains. The use of pre-treated or “gray water” and other efficiencies are reducing the need for fresh water in ethanol production. A host of new technologies allow ethanol producers to capture additional value by adding corn oil, recoverable carbon dioxide, corn syrup, bio-based chemicals, and other co-products to their traditional output of feed and fuel. In dry milling, the entire corn kernel or other starchy grain is first ground into flour, which is referred to in the industry as “meal” and processed without separating out the various component parts of the grain. The meal is slurred with water to form a “mash.” Enzymes are added to the mash to convert the starch to dextrose, a simple sugar. Ammonia is added for pH control and as a nutrient to the yeast. The fermentation process generally takes about 40 to 50 hours. During this part of the process, the mash is agitated and kept cool to facilitate the activity of the yeast. After fermentation, the resulting “beer” is transferred to distillation columns where the ethanol is separated from the remaining “stillage.” The ethanol is concentrated to 190 proof using conventional distillation and then is dehydrated to approximately 200 proof in a molecular sieve system. The stillage is sent through a centrifuge that separates the coarse grain from the solubles. The solubles are then concentrated to about 30% solids by evaporation, resulting in Condensed Distillers Solubles (CDS) or “syrup.” The coarse grain and the syrup are then dried together to produce dried distillers grains with solubles (DDGS), a high quality, and nutritious livestock feed. The CO2 released during fermentation is captured and sold for use in carbonating soft drinks and beverages and the manufacture of dry ice. After steeping, the corn slurry is processed through a series of grinders to separate the corn germ. The corn oil from the germ is either extracted on-site or sold to crushers who extract the corn oil. The remaining fiber, gluten and starch components are further segregated using centrifugal, screen and hydrochloric separators. 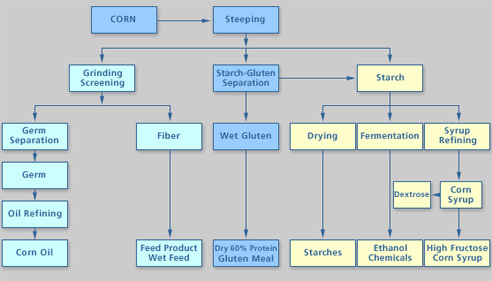 Ethanol production requires only the starch portion of a corn kernel. The remaining protein, fat, fiber and other nutrients are returned to the global livestock and poultry feed markets. Every bushel of corn processed by an ethanol plant produces approximately 17 pounds of animal feed. 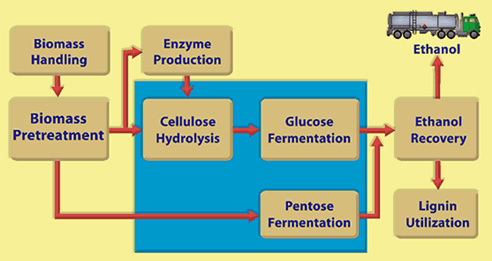 This process flow diagram shows the basic steps in production of ethanol from cellulosic biomass. Note that there are a variety of options for pretreatment and other steps in the process and that several technologies combine two or all three of the hydrolysis and fermentation steps within the shaded box. Today, ethanol makes up for 10% of our gasoline supply and can be found at nearly every station across the nation. This domestic, home-grown fuel is being utilized in all engine types, including automobiles, non-road engines and marine engines. Due to the increase in ethanol-blended fuels, small engine manufacturers have made modifications to the engine fuel systems to be compatible with ethanol blended fuels. This can be seen through the collection of varying recommendations from equipment owner’s manuals from over the years. These changing recommendations have led to some confusion about the selection of fuels to use in various non-automotive applications. To help clarify any questions, the RFA has put together The Use of Ethanol-Blended Fuels in Non-Road Engines. On March 7, 2012, President Obama made fuel efficiency and alternative fuel vehicles, such as Flexible Fuel Vehicles (FFVs), staples of his energy policy by establishing increasingly stringent Corporate Average Fuel Economy (CAFE) standards and investing in alternative fuel vehicles and fuel infrastructure. Fuel efficiency and increasing the availability of FFVs are key elements in extending fuel supplies and making better use of the resources America has at its disposal. When it comes to the issue of fuel efficiency, it is important to note that today’s current internal combustion engine and its reliance on liquid transportation fuel will continue to represent the lion’s share of the vehicle and fuel markets for the foreseeable future. This fact is critical in understanding how automakers will comply with increasing CAFE standards. A recently released analysis from auto engineering firm Ricardo notes, “the vast majority of vehicles sold through 2025 in the United States will use gasoline-fuelled, spark-ignited internal combustion engines as the primary form of propulsion.” This is significant because CAFE standards are set to rise to 54.5 miles per gallon in 2025. Ricardo reports that nearly 3 out of every 4 vehicles will require a gasoline-type, higher octane fuel to operate a growing list of engine technology options. Specifically, downsized, turbo-boosted engines designed to increase fuel efficiency in compliance with the CAFE standards will require higher octane fuels than those available at the pump today. Of the current liquid transportation fuels widely available, only ethanol offers high octane at a cost-effective price. With a blending octane rating of 113, ethanol and higher level ethanol blends are uniquely poised to help automakers achieve stricter fuel economy and emissions requirements. While most measure a fuel’s mileage based on British Thermal Units (BTUs), new engine technologies designed to meet higher fuel economy standards like turbo-boosted, downsized engines will require the higher octane level that higher level ethanol blends offer. In October 2010 and January 2011, EPA announced the limited approval of E15 for strict use in gasoline powered vehicles only. The approval came after years of research on the safe and effective use of this fuel in varying model year automobiles. This approval is strictly limited to use in automobiles manufactured in model year 2001 and newer, and was NOT approved for any other engine use. 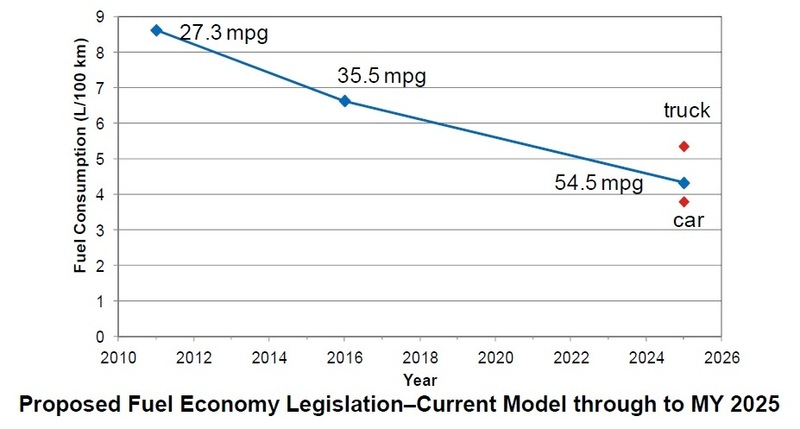 EPA’s E15 approval is not a mandate for use; it provides an opportunity for retailers to offer their automobile consumers an additional fuel choice. Until fuel blends containing more than 10% ethanol have been tested and approved for use in marine engines, watercraft and non-road engines, equipment owners should not use these fuel blends. Across the country, vehicle manufacturers offer FFVs. These vehicles are specifically designed to be able to run on any ethanol-blended fuel ranging from unleaded gasoline (0% ethanol) to E85 (85% ethanol, 15% gasoline). FFVs also have the ability to run on mid-level blends, fuel that is blended with ethanol less than 85%, such as E20, E30 and E40. If you drive an FFV, you can pretty much fill your tank anywhere, no matter what the ethanol blend is! To date, there are more than eight million FFVs operating on America’s roadways. To help increase these numbers, some of the major automobile manufacturers in the U.S., including Ford, Chrysler and General Motors, have all pledged to make 50% of all new vehicles coming off their assembly line model year 2012 and beyond FFVs. There are currently more than 2,400 E85 stations throughout the U.S., providing America’s consumers with more fuel options and opportunity to support domestically grown transportation fuels. Blender pumps are also on the rise offering customers a variety of mid-level blended ethanol fuel options like E20, E30 and E40. Secretary Vilsack recently announced that the U.S. Department of Agriculture plans to help fund the installation of 10,000 blender pumps throughout the country. In addition, the Blend Your Own (BYO) Ethanol Campaign, a partnership between the RFA, American Coalition for Ethanol (ACE), National Corn Growers Association and numerous other state corn grower associations, aims to install 5,000 blender pumps across our nation over a three year period. There are a number of ways to determine if your vehicle is an FFV. The inside of the fuel door will typically have a sticker noting E85 compatibility. Some vehicles also have a yellow gas cap signifying the option to fuel up with E85. Flex-fuel compatibility is also marked in the owner’s manual as well as encoded in the vehicle’s identification number (VIN). You should also check your owner’s manual to determine if your vehicle is flex-fuel capable. Today, virtually all of America’s fuel is blended with 10% ethanol. Some marinas offer unblended fuel for marine use. As ethanol has entered new markets, some marine equipment owners have raised questions about ethanol use in their equipment. The RFA recognizes the concerns voiced by the marine and boating community and has published information to ensure the necessary information is reaching watercraft and boat owners including an Update for Boat Owners: Ethanol Blended Fuels for Use in Marine Equipment, E10 and Winterization and Frequently Asked Questions. Avid water sports enthusiasts need not fear ethanol blends. As is always the case with a fuel change, there are some basic maintenance strategies that can be employed to mitigate any possible fuel-related issues. Typically, the maintenance issues encountered by the marine engine community arise from residual fuel deposits being cleaned up by the ethanol portion or, as is the most prevalent case, improper fuel storage and handling conditions that have allowed the uptake of water during storage. It is true that in rare instances, some vintage boats have experienced problems with ethanol-blended fuels resulting in catastrophic damage. These instances have almost exclusively involved older watercraft that utilize fiberglass fuel tanks in boat models older than 1981. Gasoline blended with ethanol should be avoided if your boat features these criteria. One way to avoid this issue is to know your equipment, read your operators manual, and talk with your marina about the fuels they offer. There is a wealth of information available to you as a boat owner on the internet. Ethanol and water sports can mix, as boaters and fishermen in Minnesota, “the Land of 10,000 Lakes” have proven for more than two decades. Communication, knowledge, and a dose of common sense will lead to a resolution to this debate on which all parties can agree. It should be noted that all gasoline is designed for its primary intended use, the automobile. In fact, the standard industry specification for gasoline is titled Standard Specification for Automotive Spark Ignition Engine Fuel. Little consideration is given to the needs of the small engine manufacturer and they find themselves designing around whatever fuels are made for automotive use. Recently, fuel blenders have extended the availability of fuels containing up to 10 volume percent ethanol (E10) to nearly every area of the U.S. Many areas across the country successfully utilize only ethanol blended fuels year round and across all octane grades, proving that ethanol blended fuels can be used successfully in all applications. E10 is interchangeable with gasoline and virtually every gallon of gasoline sold in the U.S. today contains a percentage of ethanol up to 10%. As ethanol has entered these new markets, some equipment owners and operators have raised questions about ethanol’s use in their particular equipment. Chart courtesy of: the National Renewable Energy Lab.